Football has always been a major producer of stereotypes. The invention of ‘national playing styles’ at the beginning of 20th century drew, inevitably, massively on extra-sportive stereotypes accumulated over the centuries and safely stored in national narratives of perception and self-perception. The fact that for over a century, football discourse has been produced (and endlessly repeated) mainly within almost hermetically closed linguistic and cultural areas only contributed to consolidate stereotypical images and vocabulary, often against better knowledge. But stereotypes can change, too, even if it takes time and repetitive counter-evidence. Some of the literature from social psychology draws a clear distinction between stereotype and prejudice, the difference being that the former may be weakened or even turned around and the latter is essentially immune to change. Cartoons are particularly prone to using stereotypes. The cartoonist is forced to use shortcuts that the reader can decode immediately. While some of them may personally regret this, knowing that they feed a vicious circle of simplification and generalisation, they do not have much of a choice, especially if they work under time pressure and have to comment current news. In some cases, however, stereotypes simply don’t fit anymore. The reader’s perception of reality has evolved and the stereotype is just no longer compatible with current perceptions, no longer applicable. This summer’s World Cup gives a good evidence, especially with regard to the winning nation that seems to have successfully broken with some traditional perceptions. At least in France, from where the illustrations in this post are drawn. The Panzer in the first cartoon above was the classical shortcut for the German national team. It referred very conveniently both to war images and to shared perceptions of playing style that were, at intermittences, objectively confirmed, although the 1970s had provided numerous counter-examples. To the annoyance of many Germans, the Panzer is still massively referred to in Italy. Ironically, though, the term is being used in an admirative manner, which to the Germans themselves appears as inconceivable connotation. At the beginning of the new century, with both German football and German economy in a slump, the Panzer is phased out in France. It is replaced by a ‘Mercedes’, which can conveniently be used to portray both quality or unexpected weakness. The surprise of finding a Trabant engine in a high-end Mercedes – as in the cartoon to the left, published at the eve of the World Cup), obviously refers to widespread perceptions of Germany having trouble to come to terms with reunification. Four years later, with German economy starting to recover, the focus is fully placed on football (and the persistent weakness of the German team). The shortcut that is used this time is directly borrowed from national symbolry: the eagle is convenient for being used not only for the Federal Republic but also for being flagged on the jersey’s in the DFB’s emblem. 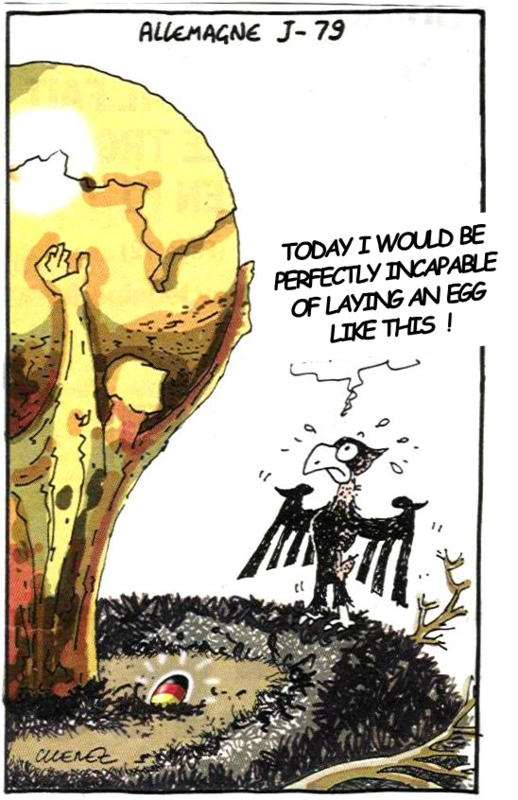 Three months before the World Cup (and given the desastrous results in friendlies at that moment) the eagle (presumably a female, as are the words ‘team’ and ‘Mannschaft’ in French and German respectively) is shown to be no longer capable of laying eggs worthy of a champion. And in 2014? Surprisingly the sports papers or sports sections of other dailies did not print cartoons on Germany. Were they running out of suitable stereotypes? On the social networks, especially after the memorable semi-final against Brazil, a short clip ciculated showing a fat Bavarian beer mug smash a graceful Brazilian caipirinha cocktail, but given the style of the German team that could definitely not be said to rely on physical strength alone, it did not really look right. Not surprising, then, that most of the online cartoons or collages focused on the collective collapse of the Brazilians, mainly referring to the Christ the Redeemer statue of Corcovado. In France, it was finally Plantu who published, as usual on the front page of Le Monde, a cartoon on the German World Cup victory (see below). Thanks to Bastille Day on 14th of July, he had an extra day to think about it. But what he came up with was a rather uninspired use of three major national symbols: the Brandenburg Gate, the three colours of the German flag, and … Angela Merkel (in stark contrast to a minuscule François Hollande). The most interesting, though hardly visible, feature of this cartoon is no doubt the European flag that the French president is carrying. Given its presence, the cartoon may be well interpreted as a picture of the new Germany, finally more nationalist than European, basking in its current strength, dwarfing its neighbour, and definitely giving more importance to the four stars on its new jersey than to the twelve stars on the European flag. Hmmm… One day even the Germans might miss the old days when their European neighbours had not much else to refer to than the stupid, good old Panzer stereotype. 2014 – The selfish giant? at ESSCA School of Management, Angers.